I awoke the other morning to my daughter asking me to quickly come over to where she was standing. There, in our house, behind a duffle bag, lay a mouse. Now my daughter loves animals and would never want to hurt them, and wasn’t sure if the mouse was alive or dead – so it was my job to determine its status. I gingerly walked over and moved a couple of things, and to my daughter’s excitement, the mouse was very much alive, but scared out of its wits. It took off deeper into our house and buried itself behind a sewing machine. We then managed to coax it outside and away it ran – to hide behind some pots right outside the front door. It didn’t make it very far and really didn’t want to go any further, but at least it was outside, somewhat safe, and alive. Fast forward a few minutes, and there is our slightly hefty white cat Lucky playing ‘cat and mouse’ with the little saved mouse. She apparently had brought the mouse into the house the night before, played with it a bit, lost it, and now had found it once again hiding outside. The game was back on – but this time we intervened to ensure that the mouse would ‘win’. Now our cat is not a mean cat at all and actually enjoys catching all kinds of critters in our yard. Her favorites seem to be lizards, much like my youngest son, nicknamed ‘the lizard whisperer’ by some of his friends. She simply likes the game of ‘catch, release, and attempt to catch again’. It’s not a bad way to spend part of the day, it appears. So I seem to have gone off and talked about something non-wine related once again. Or have I? Where’s the tie-in here? 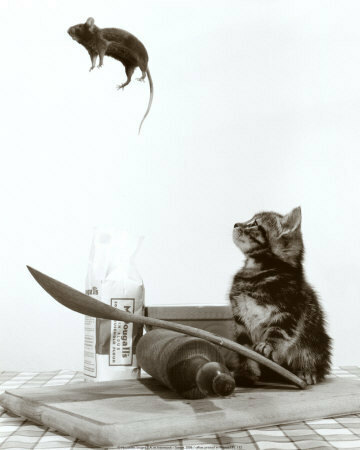 Winemaking sometimes is played like a game in much the same manner this cat and mouse give and take happens. There are many facets to the game – staking out where to ‘hide’ so as to sneak up on the grapes and pick them at the prime moment during harvest without them knowing; beginning the fermentation process and having it ‘take off’ and having to make sure it gets to run around a little but watching a wary eye on it to make sure it doesn’t ‘escape’; ‘locking the wine away’ in barrels in the same way that a cat will force a mouse to stay in a place for awhille; tasting wine out of barrel during its lifetime to check on its progress, similar to the cat ‘pawing’ the mouse where it hides to make sure it is still alive and wanting to play; etc. It’s fun to come up with analogies, and some work better than others (-: This one just happened to be on my mind this morning. Hope it put a smile on your face at least. Thanks, Terry, and I’ll try to keep writing it on a consistent basis moving forward!